Gratitude to Roy Money for his thoughtful offer to share his article Minor White and the Quest for Spirit here, knowing it would be of great interest to readers of this site, and also to Christine Cote, editor and publisher of Still Point Arts Quarterly where the article first appeared. This post is a teaser – you’ll have to click through to the page to read the whole article and view more of White’s photographs. You will not be disappointed! Minor White was one of the most influential photographers of the 20th century and he generated considerable controversy in his last years for the promotion of spirituality. I met him early in my introduction to photography and admired his work. I recently renewed my interest in him because of a developing involvement in Zen practice and efforts to explore spirituality in relation to my own photographs. Minor was not only an important artist but also a teacher, editor and curator, and his language of spirit and spirituality came at a time when it had declining credibility in the art world. Though this language had a certain resonance within the wider cultural scene of the sixties it was an early and continuing theme for White that was no doubt stimulated by the challenge of living as a homosexual in an era before gay rights. Spirituality has long been associated with finding relief from the misfortunes and injustices of the social world, as well as finding purpose in the midst of uncertainty and doubt. Of course spirituality has also been an ageless source of inspiration for artists exploring the uncharted domains of human awareness and creativity. Sourced from the public domain. The second muttering thunder annual is now available for free online viewing and download. 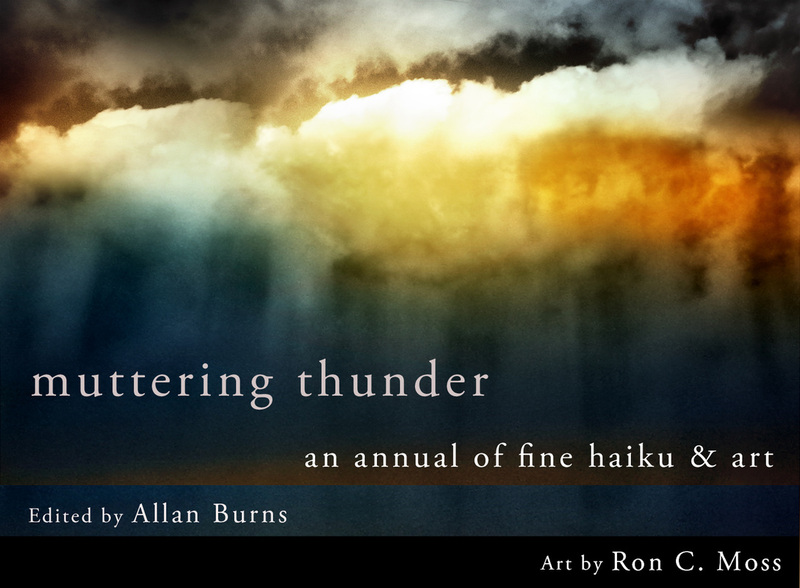 muttering thunder is the collaborative work of Tasmanian haiku poet and haiga artist Ron C Moss (whose work is featured in the artisans’ gallery on this site), and fellow poet Allan Burns. In addition to a new gathering of nature-focused haiku by leading English-language haiku poets from around the world, it includes a reprint of a classic essay by Ruth Yarrow (“Environmental Haiku”) with a new afterword by the author and a wide-ranging conversation with poet, scientist, editor, and illustrator Cherie Hunter Day. The poets featured express – each in their own unique voice – their wonderment, curiosity and compassion regarding the natural world, and the accompanying images bring an added depth of contemplation and beauty to the words. To view the album and download a copy please click on the image below. Tasmanian haiku poet and haiga artist Ron C Moss, whose work is featured in the artisans’ gallery on this site, has alerted me to the launch of his latest project, muttering thunder. He and fellow poet Allan Burns have created their first annual of fine haiku and art. It’s a compilation that aims to “encourage the development of high-quality nature-oriented haiku in English”. The poets featured express – each in their own unique voice – their wonderment, curiosity and compassion regarding the natural world, and the accompanying images bring an added depth of contemplation and beauty to the words. “muttering thunder is an annual of nature-focused haiku and art that will be published each November as an ebook, available for free online viewing and download from this page. The first annual, dedicated to the memory of Martin Lucas, presents approximately 100 previously unpublished haiku by almost 60 premier English-language haiku poets from around the world. If you are a lover of haiku and appreciate sensuous and sensitive nature photography, I know you’ll be as delighted as I am at the launch of muttering thunder. The annual is a feast for the eyes and the heart – a fine companion for one’s contemplation of the sheer wonder of nature, and of our seamless intimacy with the fabric of the world.